Time for another round of Yvo’s Shorties! This time two books from completely different genres I both ended up enjoying a LOT despite the hype around them. 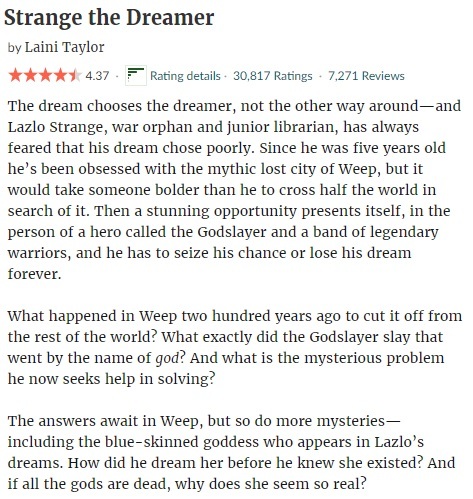 The first, Strange The Dreamer by Laini Taylor, is one of my new absolute favorites… And Lazlo one of my new favorite characters. 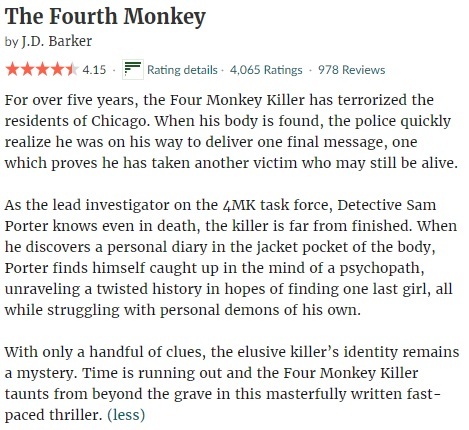 The Fourth Monkey by J.D. Barker, was dark, twisted with one hell of a creeper of a serial killer; just how I like my thrillers. 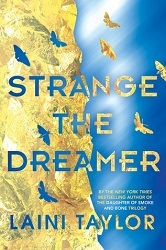 I have been intrigued by Strange The Dreamer ever since I first heard about it, but there has been such a hype around it that I have been afraid to pick it up. Because let’s face it: hyped books and me generally don’t seem to get along and I normally end up having to write yet another unpopular opinion review. But somehow when I was browsing my kindle, this title spoke to me and I just had to pick it up. Did I remember as I was starting that people had recommended to me to wait until the sequel was out? Yes, but it was already too late, because as soon as I sampled the writing style, I was addicted. Boy, Laini Taylor can write herself some absolutely gorgeous prose! The writing had me mesmerized and even if there were tiny flaws in the story, or even a slower plot at some points, I didn’t care as long as I was able to keep devouring those beautiful words. And that was not the only thing I loved. Oh no, one of the main things Strange The Dreamer works so well is its main character Lazlo. He is hands down one of my new all time favorite characters and it was an absolute delight being able to follow his story. I liked the other characters in general as well (Sarai!) and being able to connect to them only made it easier to fully emerge myself in the story and worldbuilding. Although the worldbuilding and its descriptions alone already make you wish you could see it all with your own eyes. As you can already guess, I absolutely loved Strange The Dreamer and it turned out to be my second 5 star read of the year. I’m still kicking myself for not reading it sooner, although at least the wait for the sequel is considerably shorter now this way. Basically, I have been meaning to pick up this thriller ever since it came out last year. I think it has become pretty obvious by now I can’t resist a good serial killer thriller, and this one has been on my radar especially after reading so many promising reviews. So when I saw the sequel on Netgalley, I decided to request a copy as a way to force myself to read both books. And guess what? 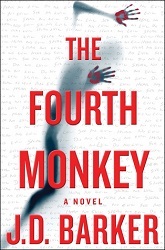 My request was approved, and I’m so glad that happened… Because I have been missing out by not reading The Fourth Monkey sooner. Dark, gritty, twisted, disturbing, intense… Just keep similar adjectives going, and they will apply to this first encounter with the 4MK killer. What a read! I like my thrillers dark and twisted, and J.D. Barker has definitely created a very disturbing serial killer to follow in this story. We get a glimpse of his childhood through a diary, and hints at his previous ‘work’ as the plot develops. And you will encounter a few plot twist bombs along the way, surprises that will catch you unaware as you are too stunned by just how twisted things were back at the killer’s home or how the case develops in the present. Oh yes, The Fourth Monkey isn’t for those with a weak stomach and if you can’t handle graphic scenes and violence, I advice staying clear. Otherwise, if you have a twisted mind like me, you will have a great time meeting the 4MK Killer and his work. And I’m looking forward to discover what happens next. I love a good pirate story and the blurb of The Unbinding Of Mary Reade sounds just as fantastic as the gorgeous cover, so I’ve been really excited to finally read this one. And with its f/f romance, I thought it would be a perfect story to read during pride month as well. Alas it seems like it wasn’t ment to be. 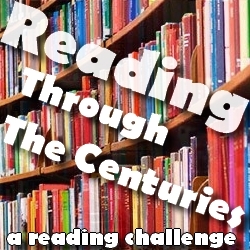 I didn’t check the reviews before starting this one, or at least I would have been warned… Because The Unbinding Of Mary Reade unfortunately turned out to be quite a disappointment. Don’t get me wrong, I still love the idea behind this book, the possibilities of the setting, the f/f romance, the characters… But the execution was just completely off for me. I will try to explain why this book didn’t work for me below. First of all, I struggled with the writing style, which felt halted with dialogues that didn’t seem natural. The use of ‘bad grammar’ in the dialogues only distracted (aka annoyed) me instead of adding the right historical atmosphere. Also, the constant switching back and forth in time was really distracting and made it hard to stay focused on the main plot. Especially since the chapters set in London basically didn’t add anything substantial to the story and were extremely dull. In fact, I found the story in general quite boring, and how is that possible for a story with gay pirates in it?? For a book about pirates, there were almost no action scenes or even scenes on a boat included in the plot. And that was quite a disappointment, since there was basically nothing of note to fill this huge hole of lack of action. Ok, characters. The characters in general lacked development and were rather bland. Anne almost felt like a caricature and while Mary had all the potential of being a fascinating character, she mostly fell flat for me and I wasn’t able to believe either of their feelings or actions. This lack of credibility extends to the other characters as well. Also, trigger warnings are in place for homophobia, transphobia, (sexual) abuse and sexism in general. I get that we are talking about an 18th century setting, but this was just too much. In short, while I still love the idea behind this story, the execution was rather poorly and The Unbinding Of Mary Reade turned out to be a rather chaoticly written, dull and not credible love story. Did I expect this reaction? No, but unfortunately I can’t change the way I feel about this one. When Mary was really young, her mother saw no other way to keep their mouths fed than to disguise her little girl as a boy and pass her off as her dead child Mark. Mark has a wealthy granny that will take care of her only grandchild and heir… So there is no place for a girl in Mary’s world, and she has to be Mark at all time to not see her life fall apart. This gets harder as the years go on and she falls in love with her childhood friend Nat. And when she is discovered, she flees London with Nat and boards a Caribbean merchant ship as a sailor. But what will the future bring? I keep repeating: I still love the idea behind this story and I truly wish I could have enjoyed The Unbinding Of Mary Reade better. Unfortunately, I found the execution lacking in various ways, and I had a hard time finishing this one. Between the chaotic writing style that didn’t flow, a rather dull plot, bland characters, lack of action and a not so credible display of emotions, I can’t say I was impressed. Where were the pirates, were was the action? Why did we have to read so much about Mary’s past in London, if her life on the Caribbean Sea is what really counts for this story? Why wasn’t there more focus on Mary and Anne? Why the excessive amount of sexism, homophobia, transphobia and sexual assault? The tone for this supposedly YA rated story was completely off, especially since Mary felt younger than the age group during most of the story. All in all not the story I was hoping for. I admit I kind of requesting this first book of a YA fantasy series on a whim after falling in love with the cover. There is just something about The Namarielle that instantly made me want to read it, and it turns out that my coverlove instinct was solid. Because there is no doubt I very much enjoyed this story! I’ve become a bit wary of YA fantasy series due to the amount of romance and repetitive plots, but I was pleasantly surprised by The Namarielle. 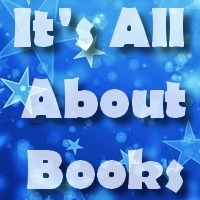 The writing is engaging and made it really easy to emerge yourself into this new fantasy world. I enjoyed the worldbuilding and the promise of an interesting past, complicated and dangerous present and the promise of a better future. Would I have liked to see the worldbuilding even more detailed? Maybe. But I’m guessing that we will see even more of Lashai in the sequel. The characters are interesting, although a bit cliche with Cassai with her mysterious past and Elian with his secrets. The connection between them is a nice touch, although a bit cheesy as well… And some of the reactions and actions of the main characters could get annoying. I did like the inclusion of different fantasy characters like werewolves and fae. They add a little extra to the plot and I’m hoping to see more of at least the fae in the sequel. I did have some problems with the frequent POV switches though, because that made it a lot more difficult to connect to the different characters. But in general this was a highly entertaining and enjoyable first book of what looks to be a promising series. The Namarielle is a very entertaining and interesting first book of a new YA fantasy series. I really liked the worldbuilding and potential of Lashai, although I would have liked to learn even more about the world… But I’m hoping the sequel will give us more details. The characters are interesting enough, even though there are quite a few cliches, and I liked the special connection of Cassai. The constant POV switches did make it harder to connect to the main characters though. But all in all it was still a solid read. 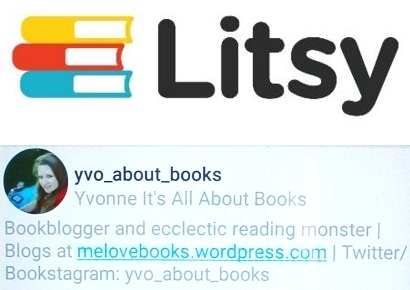 Time for another round of Yvo’s Shorties and the first round of Europe trip books! Summer Of Sloane was a TBR jar pick I thought would be a perfect way to start my vacation, but it didn’t turned out to be as good as I hoped. 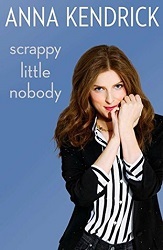 Scrappy Little Nobody I picked up in the hope of finding something entertaining and funny to read, and while it wasn’t a bad read, my lack of familiarity with Anna Kendrick might have had a negative effect on my overall opinion. Summer Of Sloane was my latest TBR jar pick and after posponing it for a long time, I thought this YA contemporary would be the perfect way to start my Europe trip. I actually finished it in the last days before our flight, as it is a superfast read. 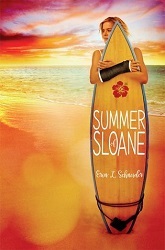 As the cover already suggests, Summer Of Sloane is what you call the perfect beach read. The writing style is easy on the eye and reads superfast, and romance fans will probably have a great time with this one. Because there is no doubt this story has a very high dose of romance, including love triangles and a whole lot of drama. While it was an easy read and had all the signs of being entertaining, it sadly was just way too heavy on the drama for me to be still enjoyable. True, I’m not a real romance fan and I’m practically allergic to love triangle, but it wasn’t just that on its own that bothered me. The constant drama and Sloane herself just really got on my nerves. I mean, if she doesn’t want her boyfriend or friend ruining her vacation after what they did, why not simply block there phone numbers and emails? Why do we as readers have to suffer through her constant complaining after she received yet another message she didn’t want to see? 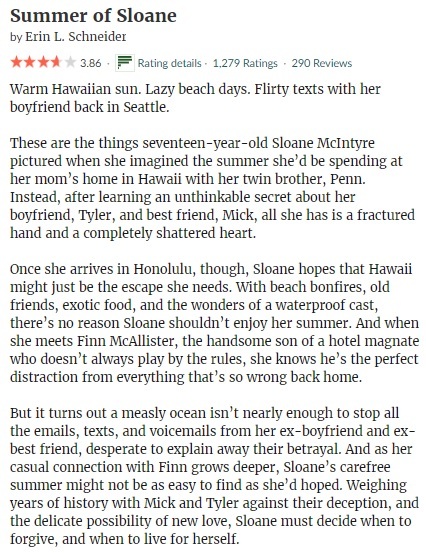 The love triangles and romance scenes themselves were supercheesy as well, but I guess if you are looking for an easy read and love the genre, you will enjoy Summer Of Sloane a lot better than I did. I picked up this memoir on a whim on the plane, wanting for something light and hopefully funny. I actually didn’t read a lot and ended up finishing it a lot later during our trip (the first week was too hectic to read much), but I guess most will finish this one superfast. It’s quite easy to read and has both funny and very personal moments of her life included. I admit I’m not really familiar with her work and that might have had an negative influence in my opinion. That said, I do admit it’s not the first memoir of famous personalities I’m not familiar with I’ve read, and I was still able to enjoy some of those more than I did Scrappy Little Nobody. I don’t mean this memoir is a bad read though, and I guess there were some parts that were really entertaining while others were brutally honest. 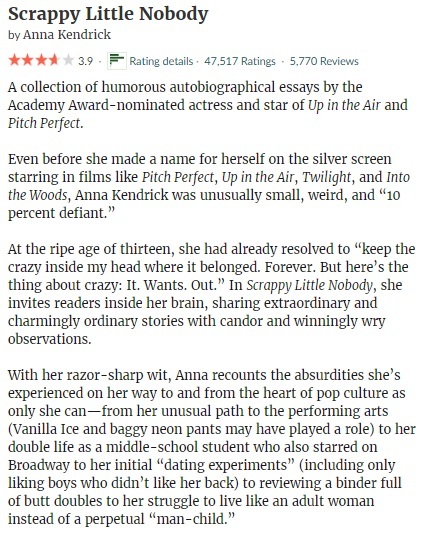 I really liked that of Anna Kendrick, letting us get a glimpse of what it was like growing up for her. And I’m sure fans of her work will love this one. I admit I was sold as soon as I saw the cover and the mention of vikings. And maybe the fact that Sky In The Deep is called one of the most anticipated YA fantasy releases this year, although that also made me a bit afraid it won’t live up to the hype. But thankfully Sky In The Deep is actually worth all the praise it has been receiving. What a wonderful and well written debut! Although this story has no exact time setting and appears to be more fantasy than historical fiction, with the viking culture playing such a central role it is easy to deduct this story was set long ago (probably 800s?). Would I have liked a more detailed worldbuilding with more descriptions and facts? Yes, but I can also understand why the exact details have been kept vague, focusing instead on the characters and clan feud plot. I would have liked to have a glossary for the foreign words and phrases used, although most are easy to interpret from the context. These little things aside, I absolutely loved this story. The main character is the typical strong female lead, but Eelyn really came alive in the descriptions and dialogue and was easy to connect to. The different clans and the old feud between the two had me completely hooked, as well as for the plot twists that changed their future forever. Definitely the best viking-inspired story I’ve read to this date! I admit I could have done without the romance, but at least we were spared the dreaded love triangle. And I’m sure romance fans will love that little twist (although I saw it coming quite early on). In short, while not perfect, this debut still managed to completely blow me away and Eelyn’s story will stay with me for a long time. Vikings to the win! Seventeen-year-old Eelyn was raised to be a warrior and fights alongside her Aska clansmen against the Riki clan. The two have been enemies for a long time, fighting each other every five years in a ruthless battle. This year is no different and Eelyn is fighting on the battlefield when something strange happens: she sees her brother Iri, the same brother who she watched die five years ago. Following his ghost, she ends up in a very dangerous situation herself…One that will be both hard to accept and find a way out of. Despite a few minor details that made me lower the rating slightly, there is no doubt I absolutely loved this book. I have a weak spot for viking stories and Sky In The Deep has to be the best viking-inspired fantasy story I’ve read to this date. The writing is very engaging and made it really easy to like this story. The plot and clan feud turning into something else was an interesting one and while there were slow parts, you will get plently of viking fighting action as well. A little advice: don’t read the full blurb before you start reading it! This one is more fun going in completely blind. YA fantasy fans who like their stories having a dose of romance, well developed characters and a couple of pretty intense fighting scenes will love Sky In The Deep. A very powerful debut! Time for another round of Yvo’s Shorties! This time around two titles I’ve been meaning to read for ages and that both turned out to be excellent reads. 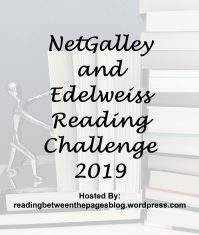 Salt To The Sea by Ruta Sepetys and Ready Player One by Ernest Cline… Popular hyped books that actually lived up to the hype and without doubt worth reading! I’ve been wanting to read this novel for a long time now, probably ever since I first heard about it. 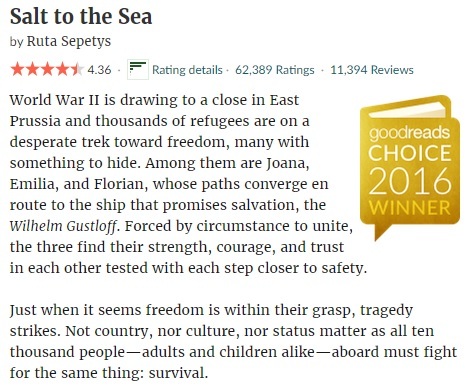 I’ve become a fan of Ruta Sepetys‘ writing after reading Between Shades Of Gray and Out Of The Easy; both because of the fantastic writing and well researched and detailed historical settings and descriptions. Salt To The Sea without doubt fits all these points above. I have a weak spot for WWII historical fiction in general and I hadn’t heard about the Wilhelm Gustloff incident before, so that was a double bonus for me. It truly shows in the little details just how well researched this novel is and the descriptions made it feel as if you were there yourself along with the characters. The plot is an interesting one and shows just how difficult it was to find your way to safety close to the end of the war. I admit it took me a while to get used to the multiple POVs and remembering who is who, which slowed down the pace inicially, but each different character and POV does show a different view on the situation and add something to the story. I was a bit annoyed by Alfred, who I didn’t like at all and I wasn’t sure about the particular style of his chapters. But the rest of the characters were interesting and I liked how the different styles used in each POV showed their different personalities. There is even some sort of interaction between the POVs and sometimes different characters tell their personal experience of the same event… Adding power to what was happening to them. Salt To The Sea is without doubt a very strong historical fiction read that shines the light on an event that is not all that well known. 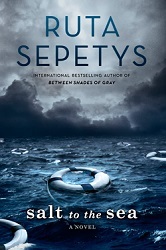 It’s not my favorite Ruta Sepetys novel, but without doubt worth reading. I have been meaning to read this one for years (and that is without exaggerating). 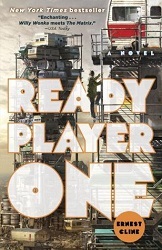 Somehow, the enormous hype around Ready Player One made me a bit afraid to actually pick it up, especially considering my complicated relationship with hyped books in the first place. I finally read Armada first last year, and I can’t say I was that impressed by it… But since people kept telling me that Ready Player One was so much better, I was determined to give it a go one day. And I’m glad I finally did do so, because I loved it so much better than I thought I would! Science fiction can go both ways for me, but as a (former) gamer myself I just loved the general worldbuilding and many many game references… The 80s references didn’t hit home, but that is mostly because I was too young to actually remember that time in the first place. And from what I could see, everything was well researched. 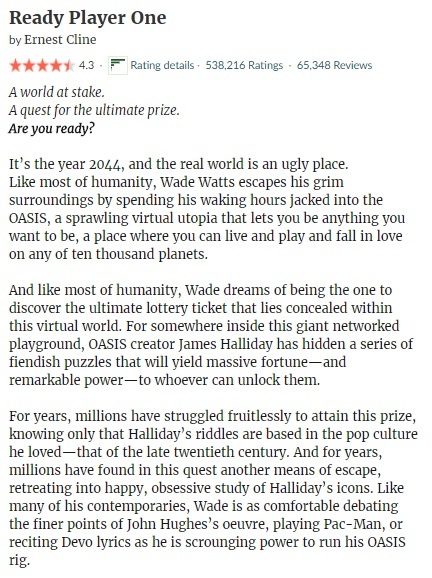 Ready Player One is set in the future, and a dystopian future at that. A very interesting backdrop for this story and very well developed! The worldbuilding wasn’t the only thing that worked well for me. I also really enjoyed the writing style itself and of course the plot, which both made me want to keep on reading to find out what would happen next. The characters are well developed and easy to like, and I could also appreciate the fact we get to see both the online side and the ‘real’ side of the main characters involved. All in all a superentertaining and well written sci-fi and gaming adventure I can recommend to fans of the genre. Time for another round of Yvo’s Shorties! This time around two contemporary romance reads I ended up actually enjoying despite the fact that the genre isn’t really for me. 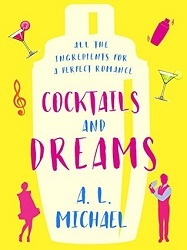 Cocktails And Dreams by A.L. Michael was such a fun read and I loved the writing style! And I loved the running element, mixed race main characters and the dragon/lioness symbolism in Wing Jones by Katherine Webber. Fact: the contemporary romance genre and me don’t always get along. Also a fact: I can still really enjoy a contemporary romance story under the right circumstances. And this has a lot to do with both my mood and if the author is able to manage to convince me. It doesn’t happen all that often, but Cocktails And Dreams turned out to be one of those exceptions. Because I absolutely adored this story! I was in desperate need of something fun and entertaining to read and this book worked like magic. 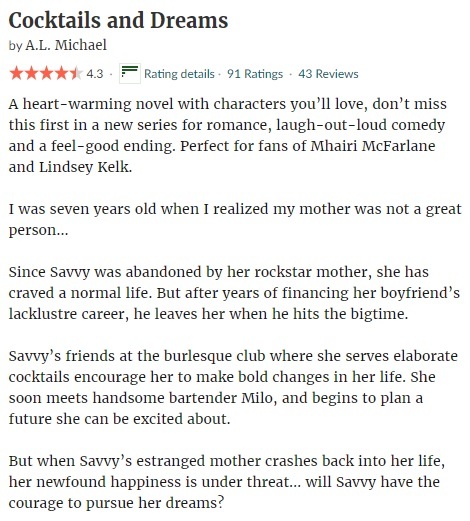 I had so much fun reading Cocktails And Dreams, and this is coming from someone who is normally allergic to romance… So if you like the genre, you will have a blast while reading this one. The writing style is engaging, easy to read and has just the right pace to allow for well developed characters and an interesting plot. The characters are really easy to like and this made me connect to the story right away… And I just loved the food and drink elements in the story, which added a little something to the plot as well. The descriptions of the different foods and drinks are simply mouth watering and will make you want to try everything out yourself! I also loved the Martini Club setting and the way the different relationships developed. I’m not too sure what to think about Savvy’s mother, but I guess it does give the story an edge. Cocktails And Dreams is such an easy story to love though! And I will definitely be looking out to get a copy of the sequel, because the writing style is fabulous. I kind of picked up this title on a whim after seeing it mentioned recently, and I thought it would be a nice change of genre. 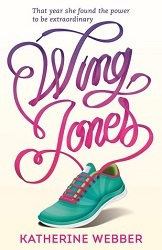 Wing Jones is a YA contemporary romance story with a twist. You will find a healthy dose of drama, with the main character Wing’s brother being in a coma after a car accident he was to blame for. There will be romance scenes as well, which can be distracting, but gladly at least did not include a love triangle. But the main element of Wing Jones, besides showing how they have to live with the aftermath of the accident, is running. 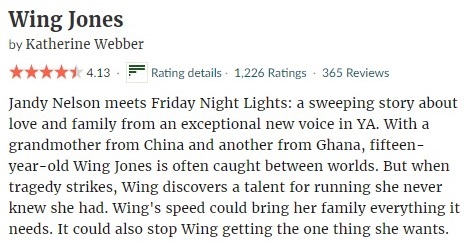 I just love how important running is in this story and how Wing uses this newly found talent to try to move on and make a life for herself. I really liked the characters in general as well as the fact that the Jones family is mixed race and how this is represented in the story. Very well done! I also loved the lioness and the dragon and how they were being used as symbols for Wing’s heritance. A little magical touch in an otherwise ‘realistic’ story and it added a little something extra to it. I did feel the middle part dragged a little and the ending was a bit rushed, but overall I had a great time reading Wing Jones. The romance and insecurity of Wing were a tad annoying as well, but the running and dragon/lioness elements made me mostly forget about that. If you enjoy reading YA contempories with a healthy dose of drama, this one will be a very good fit for you.